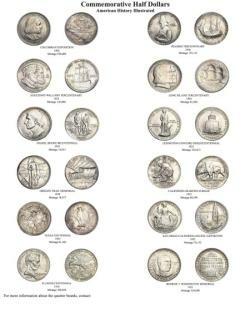 The Professional Numismatists Guild (www.PNGdealers.com) has produced two new quarter boards to house coins dated 2005 - 2008 issued by the United States Mint under its overwhelmingly popular 50 State Quarters Program. The coin holders are a joint educational project between the United States Mint (www.USMint.gov), the 33,000-member American Numismatic Association (www.money.org) and PNG. One side of each board has 20 die-cut holes for holding a collection of commemorative state quarters for a two-year period, 2005 - 2006 and 2007-2008, the final four years of the scheduled state commemorative coin series. Five states are honored each year with coins produced at the United States Mint facilities in Philadelphia and Denver - two different mint marks for each state’s coin for a total of ten coins to collect from circulation each year. 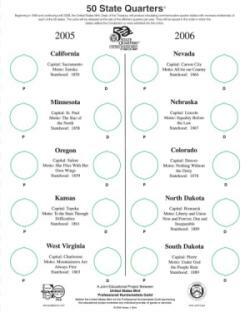 “The 50 State Quarters’ Program is having a profound, positive impact on the coin collecting hobby. Millions of Americans now collect them,” said Jeff Garrett, PNG President. The 10 states on the latest two quarter boards are: (2005) California, Minnesota, Oregon, Kansas and West Virginia; (2006) Nevada, Nebraska, Colorado, North Dakota and South Dakota; (2007) Montana, Washington, Idaho, Wyoming and Utah; and (2008) Oklahoma, New Mexico, Arizona, Alaska and Hawaii. The other side of the 2005 - 2006 quarter board has color illustrations of a dozen United States commemorative half dollars. Labeled “American History Illustrated,” the coins depicted range from the 1892 Columbian Exposition commemorative coin to the 1954 Booker T. Washington commemorative coin. The back side of the 2007 - 2008 QuarterboardTM has a 50 State QuartersTMProgram trivia test with 21 questions written and supplied by the Mint. There also is information about the Mint’s H.I.P. Pocket ChangeTM web site, www.USMint.gov/kids, that is “dedicated to promoting lifelong pleasure in coins and coin collecting” with games, informational features and interactive animated cartoons for children. Neither the United States Mint, nor the other numismatic organizations sponsoring this educational project, endorses any individual provider of goods or services. To obtain from one to five PNG QuarterboardsTM directly from PNG, send $1 to cover shipping costs to: Robert Brueggeman, PNG Executive Director, 3950 Concordia Lane, Fallbrook, CA 92028. Phone: (760) 728-1300. E-mail: info@PNGdealers.com. Web: www.PNGdealers.com. “50 State Quarters” is a registered trademark of the United States Mint.